These days, he’s leaning toward the second pole. Already, Trump has selected three retired generals for Cabinet-level jobs. On Tuesday, he formally announced that he’s nominating retired Marine General James Mattis as defense secretary. On Wednesday, multiple outlets reported that he has selected John Kelly, another retired Marine general, as secretary of homeland security. Former Lieutenant General Michael Flynn got the nod as national security adviser on November 17. That may not be the last of it. Trump has met with General David Petraeus, the former head of the CIA, apparently about the secretary of state position. Stanley McChrystal, a former Army general, said this summer he’d decline a job with Trump if offered, but his name remains in circulation. So is that of Admiral Mike Rogers, the head of the NSA. Retired Army General Jack Keane says he declined an offer to lead the Pentagon. It’s hard, if not impossible to remember such a brass-heavy Cabinet. Ulysses S. Grant, a former general, once had four former generals serving in his Cabinet in the same year—but that was in an era just after a disproportionate share of politically involved white men had served in high-ranking positions in the Civil War. The predominance of generals is already raising some conflicts. 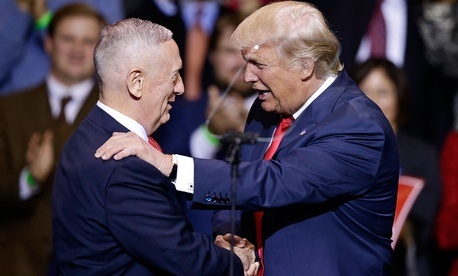 Mattis’s appointment specifically contravenes a law, intended to help preserve “civilian control” of the armed forces, that says that no one who has served on active duty within the last 10 years can lead the Pentagon. A candidate can, however, obtain a waiver from Congress to circumvent that, and it appears Mattis will get one without too much trouble. Democrats (like Leon Panetta) seem to either think he should receive the waiver, or not to care enough to put up a huge fight. There’s a debate between policy experts about the wisdom of appointing so many generals, and whether it poses a risk to the nation. Too many military leaders, critics say, warp national priorities at best and slouch toward a junta at worse. “Appointing too many generals would throw off the balance of a system that for good reason favors civilian leadership,” writes The New York Times’ Carol Giacomo. “The concern is not so much that military leaders might drag the country into more wars. It is that the Pentagon, with its nearly $600 billion budget, already exercises vast sway in national security policymaking and dwarfs the State Department in resources.” In The Washington Post, Phillip Carter and Loren DeJonge Schulman warn that “great generals don’t always make great Cabinet officials” and add that “relying on the brass, however individually talented, to run so much of the government could also jeopardize civil-military relations.” Rosa Brooks, meanwhile, suggests this isn’t much to worry about, saying that the old, formalized notions of civilian control are obsolete. There’s some concern within the military, too. During the presidential campaign, two former chairmen of the Joint Chiefs of Staff criticized Flynn and retired Marine General John Allen, who backed Hillary Clinton, for intervening in politics, worrying about what effect their campaigning might have on civilian-military relations. One can imagine that leaders in the Navy and Air Force, thinking of the longstanding rivalries between branches, might be getting nervous seeing former Army and Marine generals gaining so much influence at the White House. But setting aside the good or bad of the appointments, what might account for Trump’s disproportionate reliance on brass? It’s tempting to offer a psychoanalytic explanation. Trump seems somewhat star-struck by generals; this is a man who attended military school, but repeatedly obtained draft deferrals on somewhat questionable bases, and may glamorize generals in a vicarious way. Trump, the consummate entertainer, also seems enthralled by dramatic figures like Patton and MacArthur, as my colleague James Fallows has noted, either in real life or through on-screen depictions. Some of the reasons may be more pragmatic, though. First, Trump has no national-security experience, and has shown very little interest in gaining it. It’s important for both his administration and his credibility to have people who know what they’re talking about around him, and the military imprimatur provides that. Second, Trump alienated so many civilian Republican figures—especially those in the national-security and defense realms—that he has little choice but to look outside the proven class of civil servants. There’s also a political valence to it, however. Trump has spent the last few months promising to “drain the swamp,” and railing at the establishment and the Republican Party. That rules out almost anyone traditionally qualified for top jobs, even ones willing to serve in a Trump administration. The military is one of the few institutions that remains widely trusted by American society. In a Gallup poll this summer, it was the most highly ranked option, exceeding even small businesses and churches. At 73 percent, the number of people saying they trusted the military at least “quite a lot” was more than double those who said the same about the presidency. Choosing ex-generals for top spots, then, checks a lot of boxes for Trump: He can appoint proven leaders who are willing to serve and will start out with a baseline level of trust with the American public. Of course, this explanation only goes so far: Trump’s other picks have included billionaire business leaders and former bankers including Steven Mnuchin, Wilbur Ross, and Betsy DeVos. In the Gallup poll, banks and big business, fared much worse, at 27 and 18 percent, respectively.